It is called Movies at the Museum and that’s exactly what it is – a screening normally showcasing early classic cinema every month at Mumbai’s Dr Bhau Daji Lad Museum, Byculla. With my love for anything vintage and retro, my intention is always there to be present at each and every of these screenings but the very thought of travelling all the way to town from the distant suburbs (where I stay) is tiring enough to put me off. But when I found out the film being screened a couple of days ago was the Fearless Nadia starrer Diamond Queen (1940), there were no two ways about it. I had to see it. 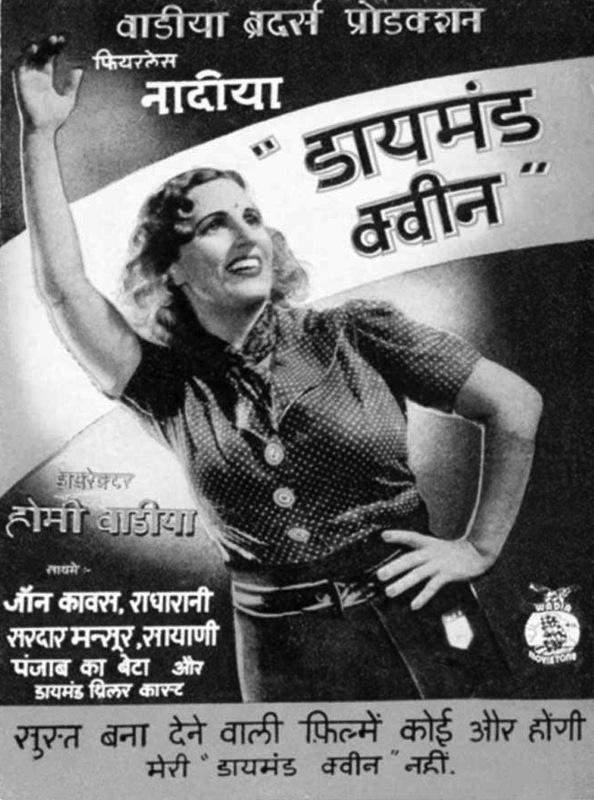 Fearless Nadia films, produced by Wadia Movietone, were a genre unto themselves. Who can ever forget the blonde Hindi cinema whip-yielding heroine who rode horses, swung from chandeliers, fought lions and bashed the villains to pulp with her characteristic cry of Heyyy! Movies like Hunterwali (1935), Miss Frontier Mail (1936), Pahadi Kanya (1936), Hurricane Hansa (1937), Lutaru Lalna (1938) and many more were not just great fun but have since acquired quite a cult following amongst those who follow classic Indian cinema. While these films were primarily highly physical escapist stunt movies, they cleverly incorporated socialist and feminist messages as well into their storyline and that’s what makes them all the more fascinating. But this is not a review of the film, it’s more about an evening well spent – first a walk through some of Byculla’s charming lanes and by-lanes guided by friend and fellow filmmaker, Batul Mukhtiar, who grew up in those parts, followed by the showing of Diamond Queen. It was heart-warming to see a full house with the audience really getting into the spirit of the film. True, the film has dated having been released 75 years ago and I would also say that technically, the work done in the same period by other film companies like Prabhat, Bombay Talkies and New Theatres was more polished but what made Diamond Queen stand out for me in spite of its lack of logic, some inadvertently funny FTII diploma moments and a script that went all over the place, was its highly infectious sense of fun coming from within. Each and every person within the film seemed to be having a great time on-screen and this feeling permeated down to the audience as well. What was interesting was the nonchalance atmosphere prevalent throughout the film even in scenes like where Nadia (rightly) declares that if India is to be truly independent, then her women too have to be liberated or when her father forbids her to meet John Cawas anymore, she calmly walks over to Cawas standing across the room, telling her father that isn’t possible as she intends to marry him. Why, she even chides her father who tries opening a letter sent to her saying it’s not correct to read others’ letters. Of course, as was the stereotype in those days, this is happily attributed to the fact that she went to Bombay to study and has come back a Modern Miss from there. The sequence where she acts coy with Cawas is a hoot – in a good way! And I have to say I enjoyed the antics of Daughter of Rolls Royce and Punjab Ka Beta throughly! A rousing reception from the audience, an engaging Question and Answer session moderated by fellow filmmaker Paromita Vohra and a dinner to die for with friends who had come for the screening at the Persian Durbar restaurant close by rounded off the evening. As Nadia would say – Heyyyy!